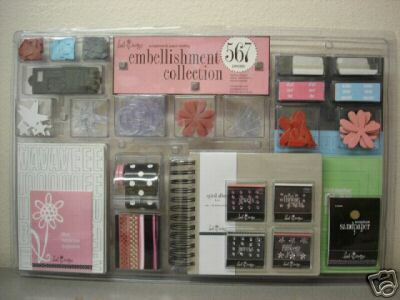 This tip just came in from Suni (an avid 2Peas reader): Heidi Swapp 567 piece embellishment kits are now available at the Costco in Frederick, MD. They're only $29.99, which is an amazing deal. Apparently it can be found (at the Frederick Costco) on the side with the optical lab, near the mattresses. I might have to make a quick trip this week! The Arundel Mills, MD Costco is also carrying this product. Added 7/24/06 - My friend Jeanette found and purchased a Heidi Swapp embellishment kit at the Costco in Manassas yesterday. They were down the aisle where the toner cartridges and office supplies are located. 40% off on all QuicKutz! This sale is really too good to pass up! If you own QuicKutz or a Zip-E-Mate, you should really make the drive! Scrap Mania! in Hagerstown, MD has a fantastic deal for their customers. Beginning in April, they told their customers to hold onto their receipts. This Saturday, June 10th, customers can bring those receipts back into the store and trade them in for Mania! Money. Beginning at 11:00 a.m. on Saturday, customers can use their Mania! Money in an auction for new merchandise, class samples and gift certificates for classes. How fantastic is this? You are rewarded for all the money you spent in the past! I love it when stores genuinely appreciate their customers. Too bad I'm teaching, or I'd definitely be there!